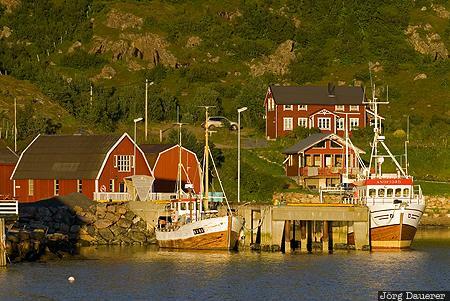 Typical red Rorbuer huts and boats in a small harbor near Straume illuminated by warm evening light. Straume is on the island Langøya, part of the Vesterålen archipelago, Nordland, Norway. This photo was taken in the evening of a sunny day in August of 2010. This photo was taken with a digital camera.